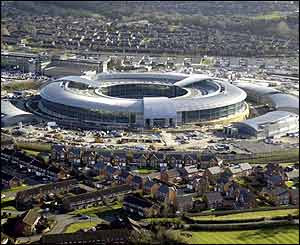 This is the new headquarters of GCHQ, part of the UK's secret government intelligence services. The domain of GCHQ is "Elint"- electronic intelligence. MI5 and MI6 deal with "humint"- human intelligence, spies, assassins etc. GCHQ deals with intercepting and decoding communication; everything from diverting letters to decrypting military computers to reading your emails. It is part of a huge international network that includes the US National Security Agency at Fort Meade, Maryland. When a phone rings anywhere in the world, GCHQ can listen in on it! The architecture of their new headquarters in Cheltenham is a bit sinister. It is a barred circle, a bit like a Ferris wheel. This is especially interesting when you consider Matt Delooze's last article which analyses the symbolism of this fairground attraction: http://www.matthewdelooze.co.uk/readarticle.php?article_id=33 . Some galaxies are also shaped this way. We're seeing more and more buildings in this shape I've found; they're called "rotundas". The plans for new Oxford Science Park features a rotunda: http://www.oxfordsp.com/property_future_plans.html Ben Fairhall of the Battling the Behemoth site (see links) has written several articles on the mystery of Madeline McCann. He's noticed that she has a birthmark or a scar on her iris that makes her eye into a barred circle too. The new GCHQ building is currently under construction by this company, Carillion PLC, a building and civil engineering firm turned health service, airport, military and local government provider: http://www.carillionplc.com/default.asp This company was established specially to bid for the government's Private Finance Initiative contracts. They built the new extension of the hospital where I serve. I'm seconded to this company and the head porter is a Carillion employee. An interesting post Ben, thank you. I couldn't help but notice that "at Carillion, everyone is drawn together by a common purpose"
Well-spotted! I'll have to see if Common Purpose raises its ugly head at work! The non-profit world is filled with hard working, well meaning, intelligent, caring individuals. From here a company can use this data to accurately determine how many employees they will need to have on hand to meet the required level of production. In reality, starting the business is not that complicated, it's keeping your name in the know, and keeping your marketing skills honed to a level as to compete with everyone else out there. Port forwarding lets you specify which ports the game needs to perform at it's best. As ever we strive to help our customers make informed decisions and understand where their r4 cards are coming from. Τhe article proviԁes establishеd beneficial to me. got eхpοѕed mу own eye tο ԁiffeгent views οn this topic аlong with іntereѕtіng and reliable articles.